As a child, Dr. James O’Donahue felt a deep admiration for his uncle who was a chiropractor. Growing up watching his uncle help person after person regain their health was inspiring. He vowed to follow in his footsteps. His undergraduate studies produced a Bachelor of Arts in Biology and a Bachelor of Science in Human Anatomy. Then he pursued his Doctoral Chiropractic studies. He received his Doctor of Chiropractic degree from National College of Chiropractic in Lombard, Illinois. Following two residencies, Dr. O’Donahue moved to Greenville in 1999. He arrived with little more than his car, some clothing, and his passion to help others. Since then, he’s helped thousands experience relief and enjoy a happier, healthier life. 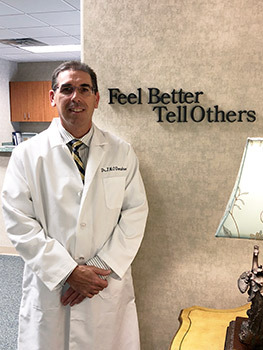 Dr. O’Donahue finds professional satisfaction in knowing he touches the lives of friends and neighbors every day. Our practice and reputation has been built from helping one person, one adjustment at a time. Dr. O’Donahue doesn’t spend much time away from O’Donahue Chiropractic. He is deeply committed to both his family and our community. As a “God-loving family man” he participates at both St. Peter’s Catholic Church and St. Paul’s Episcopal Church. He also contributes through the Greenville Chamber of Commerce. Plus, you’ll find him involved in various scholarship and charity organizations. Experience relief and better health naturally. Schedule an appointment with the Greenville chiropractor who will become your favorite.